Dr. Douglas A. Roth has been in practice at CareMount Medical as their first plastic surgeon since 1999. He is a recognized expert with a large experience with cosmetic surgery of the face and body. 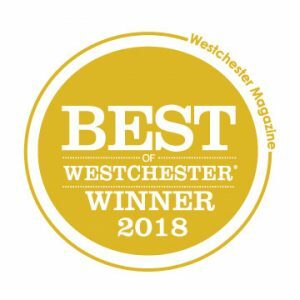 Dr. Roth is the Chief of Plastic and Reconstructive Surgery at Northern Westchester Hospital in Mount Kisco, New York, and the Director of Plastic Surgery at CareMount Medical Group. Dr. Roth provides high quality cosmetic and reconstructive surgery results combined with individualized and compassionate patient care. Double Board Certified by the American Board of Plastic Surgery and the American Board of Surgery, Dr. Roth is uniquely qualified and always requested by his physician colleagues to treat a wide range of plastic surgery and cosmetic surgery cases. Dr. Roth is fellowship trained in Microvascular Surgery and specializes in DIEP flap breast reconstruction procedures. Dr. Roth's areas of expertise include both non-invasive BOTOX® and Juvederm® injections in the face and traditional cosmetic surgical procedures such as blepharoplasty, rhinoplasty, facelift surgery, liposuction, abdominoplasty, and breast augmentation. Two main areas of expertise in reconstructive surgical procedures include breast cancer and skin cancer. For breast reconstruction, Dr. Roth offers all the options including implant and autologous DIEP Flap procedures. Dr. Roth specializes in treating skin cancer on the face and body including the repair of Mohs excision defects on the face. He is a Fellow of the American College of Surgeons and a member of numerous national medical societies including the American Society of Plastic Surgeons and The New York Academy of Medicine. Dr. Roth is fully board certified in Plastic Surgery and has surgical privileges at Northern Westchester Hospital Center in Mount Kisco, the Ambulatory Surgery Center of Mount Kisco, Lenox Hill Hospital and Manhattan Eye, Ear and Throat Hospital, New York. Private Operating Room - Fully accredited ambulatory surgical suite in the office with board certified anesthesiology services available. Ideally suited for eyelid and liposuction procedures. Smartlipo - The newest technology is now laser assisted liposuction body contouring, available for the neck, jowls, abdomen, arms and legs. Non-Invasive Cosmetic Injectables - Minimal bruising and minimal to zero-pain cosmetic BOTOX® and Filler injections. Dr. Roth has perfected his technique over many years with the use of topical anesthetics. Facial Rejuvenation - Dr. Roth is an expert in blepharoplasty (eyelid lift) and short scar quick recovery facelift procedures. Cosmetic and Reconstructive Breast Surgical Procedures - Including short scar breast reduction, Silicone gel Breast augmentation, Breast Lift and Post-mastectomy Breast Reconstruction with microvascular DIEP Flaps and other perforator flaps. These procedures are for patients who want to enhance their physical appearance or because they have asymmetry from congenital problems or after breast cancer surgery. Child-Friendly Stitches -We treat hundreds of toddlers and young children for lacerations on the face. The patients and parents are often able to bypass the emergency room and come directly to the office. Facial Reconstruction - Post Skin Cancer Mohs Defects. Repair of the nose, eyelids, cheeks, forehead and ears with the proper aesthetic results is always the goal. Dr. Roth studied chemistry at M.I.T. in Cambridge, Massachusetts and graduated in 1986. He then entered New York University School of Medicine and graduated in 1990. Dr. Roth's surgical training consisted of a five year general surgery residency at NYU Medical Center. That was followed by a two-year plastic surgery residency at the internationally renowned Institute of Reconstructive Plastic Surgery at New York University Medical Center, under the direction of Dr. Joseph G. McCarthy. Dr. Roth received broad training in all types of reconstructive plastic surgery for trauma, burns, birth defects, post cancer defects and cosmetic surgery. He had a total of nine years of post-medical school surgical and plastic surgical residency training. Dr. Roth also has a very solid background in scientific research from his work at M.I.T. and as a Westinghouse National Science Talent Search Winner in 1982. During his general surgery residency, Dr. Roth did a one-year Research Fellowship in craniofacial surgery at the Institute of Reconstructive Plastic Surgery. He started many projects on growth factors in abnormal cranial suture development which are still being developed and actively advanced fifteen years later. Dr. Roth presented his research work at multiple national conferences and published fourteen original research papers. He has also published many scientific papers and book chapters in the field of plastic surgery on topics including facial reconstruction and abdominal wall reconstruction. In addition, Dr. Roth trained at the Manhattan Eye, Ear and Throat Hospital in New York City where he worked with many of the most well-known aesthetic plastic surgeons including Dr. Aston and Dr. Baker. 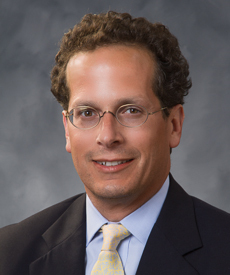 Dr. Roth was then selected for the Fellowship in Microvascular Surgery at New York University Medical Center/ Bellevue Hospital where his experience ranged from finger, hand and limb replantation to complex microvascular tissue transfers in major trauma cases and post-cancer surgery, including TRAM flap reconstruction for breast cancer. Learn more from Dr. Roth about DIEP Flap Breast Cancer Reconstruction, also known as Deep Inferior Epigastric Artery Perforator, which is an advanced microsurgical technique used post-mastectomy to recreate the patient’s breasts using their own tissue. 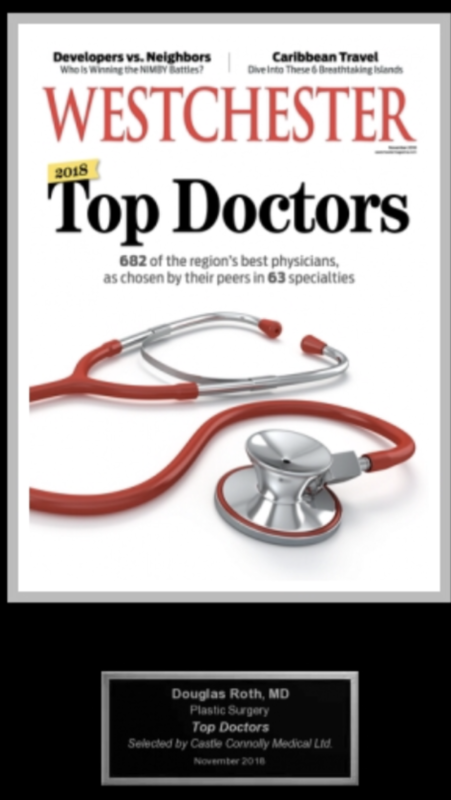 Dr. Roth as been included in multiple Top Doctor and Best Doctor lists consistently over the past six to ten years. 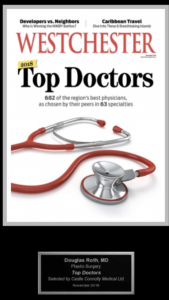 Dr. Roth was featured in Westchester Magazine's Top Doctors in the November 2007 - 2016 issues. He is listed in Castle Connolly's Top Doctors in New York Metro Area for 2008 to 2016 and Best Doctors in America 2009-2012. Dr. Roth was recently selected for New York Magazine’s Best Doctors in 2015 published in June, 2015 He was in Bedford Magazine's "A Day in the Life of a Plastic Surgeon," (January/ February 2006). He was also featured in the February 2006 issue of Westchester Magazine's "Secrets of Our Most Gorgeous Women", and the New York Journal News' Hospital and Health Update, "How Do You Put Your Health Picture Together? ", September 24, 2006.